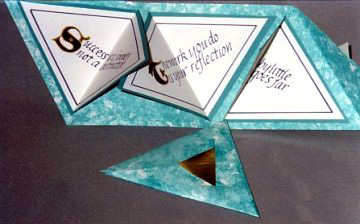 A teal watercolor wash colors this triangular accordion-fold book. Within the accordion folds are three fold-out signatures, each containing a quotation written in purple and with an initial capital edged in gold-colored ink. The quotations are as follows: "The work you do is your reflection." "Success is a journey not a destination." "Little by little one goes far." Book 6" x 6" x 6" (15.2cm). Mary Ann Angel is not online.